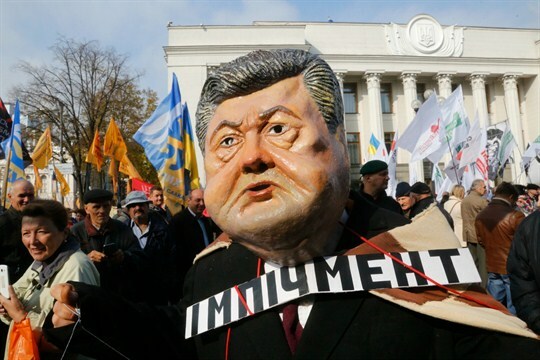 A protester wearing a mask of President Petro Poroshenko and a sign with the word "Impeachment" attends a rally outside the Ukrainian parliament, Kiev, Oct. 17, 2017 (AP photo by Efrem Lukatsky). Today in Ukraine, both inside the government and out, it isn’t uncommon to hear that President Petro Poroshenko is no less corrupt than Viktor Yanukovych, the Kremlin-connected leader who was ousted in the 2014 Maidan revolution. The main difference between Poroshenko and Yanukovych, according to many Ukrainians, is that the Poroshenko administration is simply far more duplicitous at presenting a polished image to Western donors.